Hello folks, I think you want to delete WeChat account permanently from your desktop, mobile or iPhone device. You have many reason to delete WeChat account permanently. So, i am not going to ask you reasons but i want to help you about your query. So here i stat with some prior introduction and then tell you the best steps to delete wechat and its account permanently. In present Scenario we have different types of messaging application available like WhatsApp, BBM, WeChat, Hike etc. which are easily available on playstore. Now days messaging applications are quite popular with social interactions transitioning from public to private, social messaging apps are now being seen as that which holds great potential for marketing. Using these application can improve brand services and making customer support more personal are just some of the opportunities that social messaging apps can be harnessed by brands. But sometimes we get bored with these applications and leave them by deleting account or by uninstalling. Most of the people prefer uninstalling. But for safe cause you should prefer deleting the account and then uninstalling the application. Some of the application gives this feature easily but with WeChat user gets some sort of difficulties. WeChat is owned by Tencent Company Limited, China. Since it is chines application that’s why very extremely popular in China and has increasing number of users in other part of the world. WeChat is about much more than text-based chatting. We chat is extremely popular Chinese app, currently they have more than 864 million users, it provide feature of video messaging, group video conferencing, and also has a feature of Snapchat-style social stream of six-second video clips. It also have exciting feature of providing streaming video from ESPN and the NBA which let sports fan to use this application. WeChat also give facility of transfer a payment through app, allowing users to send money directly to one another, pay the bills of small billing items like coffee shops etc. People living in china even use the app to pay utility bills, hail cabs, and schedule doctor’s appointments. WeChat’s dominance at home doesn’t necessarily mean a rapid expansion overseas. Apps like Facebook-owned WhatsApp and Messenger make WeChat’s international ambitions harder to achieve. 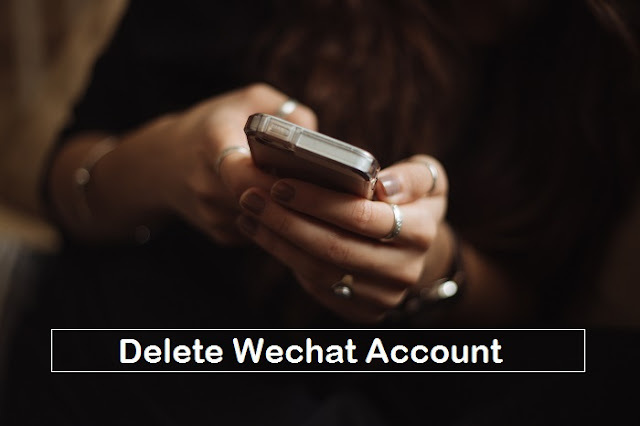 Now your first step in order to delete wechat account permanently first and foremost thing you need to clear the chat history of your account by login into your wechat app. 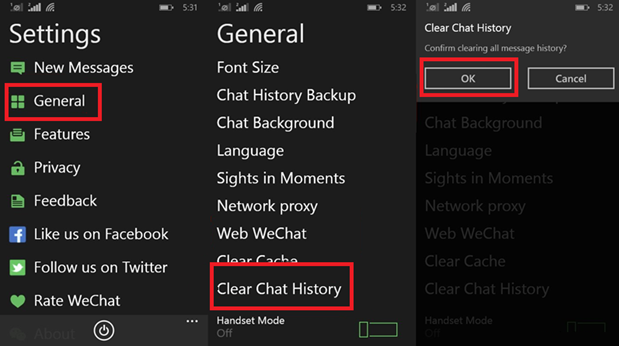 You can refer image below here you need tyo go seetings>>General>> clickon”Clear Chat History” button and then click ok to clear chat history. After completing first step i. e. clearing your WeChat application’s chat history now you have to unlink your wechat account which are linked to other accounts and applications like Facebook, instagram and other social sites. Keep in mind that you didn’t delete your email address from the linked account because we have to request them about the account cancellation. Now after clearing the chat history and removing the linked account now it’s time to delete the WeChat account but how can we do so? There is no direct delete option for it? Then after all these steps you can contact them about the account cancellation and then they will cancel your account you can contact them via their contact us page. Since Wechat have some drawbacks due this WeChat can’t achieve its goal in international market. There are of course disadvantages of instant messaging. As compared to other messaging apps like whatsapp, facebook messenger, it’s not as much as secure too. In case of the real time response we can appreciate the app, since IMs do take away the face to face, personal experience that people have when they are speaking to someone in person. Uncertainty that the unknown person can reveal your identity in case when you are not very familiar with the things and risks of the internet. This can be dangerous. Your system may get attacked by virus and get corrupted if you click on some link by unknown person who want to revel your identity and it will risky in case of terrorism issue so if you won’t let these thing should be happened with you. You should be aware from such instance. We have some other disadvantages too regarding this application but our main issue through this article is Wechat does not allow user to delete there account directly. If you are using WeChat and want to leave WeChat you should delete your account but you have noticed that you can’t delete it directly. Finally you have to do for deleting your account permanently after requesting them about account deletion just uninstall the WeChat application from your Smartphone and then your WeChat account will be deleted permanently! Thank you for reading my complete article. I think you like it and get better and quality information. If you have any query related to this information and you want to add your experience then comment below down your info with us or share this post with your friends and other people.